Implementation of a half-duplex line oriented telnet connection. The server sends a prompt. The server replies by one or more lines followed by the prompt. To get replies line until all the lines of the replies have been read. [in] prompt Prompt string to send to the client. Send a request to the server. [in] str The string to send to the server. [out] line The received line. True on success, false on error. Return true until the last line of the replies has been received. Connect to a remote address and port. Use this method when acting as TCP client. 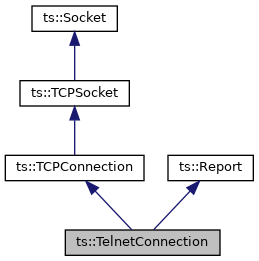 Do not use on server side: the TCPConnection object is passed to TCPServer::accept() which establishes the connection. [in] addr IP address and port of the server to connect. True if the socket was successfully connected to the peer. Get the connected remote peer. [out] addr IP address and port of the remote socket. Get the connected remote peer as a string. A string representation of the IP address and port of the remote socket. Close the write direction of the connection. The application shall call this routine after sending the last message but may still want to receive messages, waiting for the peer to voluntary disconnect. [in] data Address of the data to send. [in] size Size in bytes of the data to send. This version of receive() returns when "some" data are received into the user buffer. The actual received data may be shorter than the user buffer size. The version is typically useful when the application cannot predict how much data will be received and must respond even if the user buffer is not full. [out] buffer Address of the buffer for the received data. [out] ret_size Size in bytes of the received data. Will never be larger than max_size. Receive data until buffer is full. This version of receive() returns only when sufficient data are received to completely fill the user buffer. The size of the actual received data is identical to the user buffer size. The version is typically useful when the application knows that a certain amount of data is expected and must wait for them. [in] size Size in bytes of the buffer. This virtual method can be overriden by subclasses to be notified of connection. 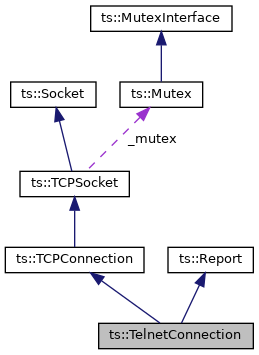 Reimplemented in ts::tlv::Connection< MUTEX >, and ts::tlv::Connection< ts::Mutex >. This virtual method can be overriden by subclasses to be notified of disconnection.